After, my post concerning the XML parsing with JAXP (SAX and DOM APIs), here, I would present simple examples of validation XML stream with the JAXP (Java APIs for XML Processing) API which is a common interface for creating, parsing and manipulating XML documents using the standard SAX, DOM and XSLTs. XML has become indispensable in Information Systems Architectures and J2EE. Used as a standard format for data exchange, standardized by the W3C, the XML document is present everywhere in applications, databases, and is at the heart of EAI exchanges. In this fact, the knowledge of the APIs of XML parsing like DOM, SAX is often necessary in the development of a J2EE application. Understand the differences, strengths and weaknesses of these APIs is important to avoid performance problems that may be encountered on these complex APIs. So, to process the XML documents, an application needs an XML parser to tokenize and retrieve the data/objects in the XML streams. An XML parser is the programme between the application and the XML documents which reads a XML stream, ensures that is well-formed, and may validate the document against a DTD or schema definition XSD. The JAXP (Java APIs for XML Processing) provides a common interface for creating, parsing and manipulating XML documents using the standard SAX, DOM and XSLTs. A XML document is well-formed, if its structure meets the XML specification, i.e. it is syntactically correct. A XML document is valid, if it is well-formed AND if its structure and datas (elements and attributes) meet the specifications defined in definition documents. In this article, we will study examples with the Document Type Definition (DTD) and XML Schema Definition (XSD). Document Type Definition (DTD) describes the objects (such as elements, attributes, entities) and the relationship of the objects in a XML document. It specifies a set of constraints and establishes the trees that are acceptable in an XML document. A DTD can be declared inside an XML document (i.e., inline), or referenced as an external file. o CDATA (Character Data): text strings that will not be parsed for entity references and tags. o ID: an unique identifier. o IDREF, IDREFS: reference(s) to a previously defined ID. o ENTITY, ENTITIES: external entity(entities). o NMTOKEN, NMTOKENS: word(s) not containing spaces. o Enumeration: list of NMTOKEN separated by “|”. o #REQUIRED: must be provided in the document. o #IMPLIED: use the application default. o #FIXED value: must use this value. o A literal default value. DTD has its own syntax (which is inherited from SGML DTD) and requires a dedicate processing tool to process the content. It does not use XML syntax and XML processor. DTD does not support object-oriented concepts such as hierarchies and inheritance. DTD’s data type is limited to text string; and does not support other data types like number, date etc. DTD does not support namespaces. DTD’s occurrence indicator is limited to 0, 1 and many; cannot support a specific number such as 8. Note: The current version of XSD 1.1 (september 2012) became a approved W3C specification in April 2012. 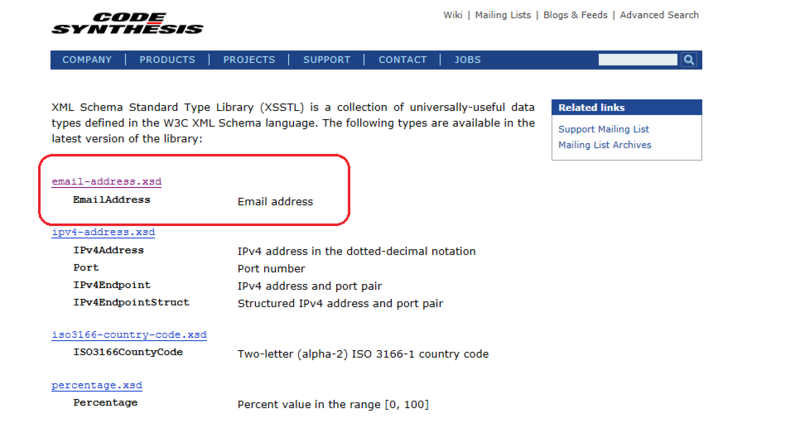 This article outlines the XML-Schema but is not a reference to the syntax of this language.
. It is also possible to block the substitution. XSD is a description language to define the structure and content type of an XML document. It overcomes the limitation of DTD and meant to replace DTD for the checking of XML document validity. XSD allows the creation of standards (Internet languages like xHTML, RSS, WSDL…etc), allows the data integrity, allows a very accurate validation compared to the DTD. However, XSD has the limitation to be long to write for complex structures. The XML Schemas are XML documents, hence, all tools (validators, parsers, processors, …) but also scripts and languages (XSLT, XPath, …) working on XML documents, are used on XSD documents. It is possible to use and to interact very easily the XSD documents themselves. Example n°1: We need to communicate a date via a XML stream between 2 different systems like SAP (mm.dd.yyyy) and RMI server (dd/mm/yyyy). These systems have an incompatible date format, however, with XSD, we can use the date type which the format yyyy-mm-dd. Example n°2: We need to validate an email address, however, there is not standard type for the format of an email address; no panic!!! with XSD, we can define new type “EmailAddress”. We could define an own format, but there are a lot of collection of universally-useful data types defined in the W3C XML Schema language like XML Schema Standard Type Library (XSSTL) at http://www.codesynthesis.com/projects/xsstl/. Here, we will validate XML Documents with DTD and XSD via JAXP APIs (SAX, DOM). Many Java XML APIs provide mechanisms to validate XML documents, the JAXP API can be used for most of these XML APIs but configuration differences exists. This article shows some ways of how to configure different Java SAX and DOM APIs using JAXP for checking and validating XML with DTD and XSD. To report errors, it is necessary to provide an ErrorHandler to the underlying implementation. * To report errors, it is necessary to provide an ErrorHandler to the underlying implementation. // Disable the document validation as the document is being parsed. // Enable the document validation as the document is being parsed. // Get a validator from the schema. Thanks for the very detailed examples!